Low-foaming formula with no synthetic detergent foaming agents, fluoride-free, vegan and cruelty-free, no artificial colors, flavors, preservatives, or sweeteners. 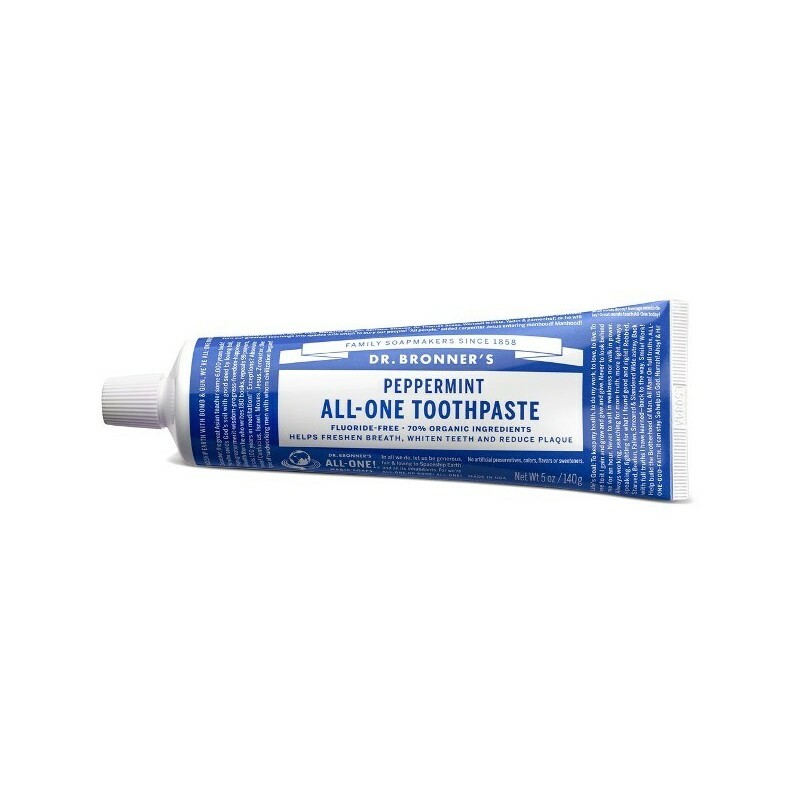 With organic ingredients like Coconut oil, Coconut flour and Peppermint oil, this all-in-one toothpaste will freshen breath, whiten teeth and reduce plaque. 140g. Freshen breath, whiten teeth and reduce plaque, all-in-one! Fair Trade and organic Coconut flour and oil used traditionally in India, provide a gentle, effective clean. Ethical sourcing - Dr. Bronner's provides detailed and honest disclosure of where they source the ingredients in their products, with info regarding fair trade certifications, work and farming conditions, sister companies. Naturally flavoured with Peppermint oil. Organic Glycerin#, Organic Aloe Barbadensis Leaf Juice, Hydrated Silica, Calcium Carbonate, Xanthan Gum, Sodium Bicarbonate (Baking Soda), Potassium Cocoate (made with Organic Coconut Oil*), Organic Mentha Piperita (Peppermint) Oil, Organic Mentha Arvensis (Menthol) Crystals, Organic Cocos Nucifera (Coconut) Flour*, Organic Cocos Nucifera (Coconut) Oil*, Tocopherol, Citric Acid, Organic Stevia Rebaudiana Leaf/Stem Extract. *Certified Fair Trade Ingredient. #Dr Bronner's advised us 03/2017 that it uses Glycerin derived from non-GMO soy and Tocopherol made from non-GMO sunflower seed oil. 140g (5 oz). Recyclable box and tube. Browse our other natural oral hygiene products. I love Dr Bronner's products! This is one of my favourites to use to clean my teeth, It's thick and has a lovely minty taste. Thought I would give this toothpaste a try & I'm glad I did. It leaves my mouth feeling fresh & clean & has a lovely mint flavour. Dr Bronner is also a very ethical company which I am glad to support! 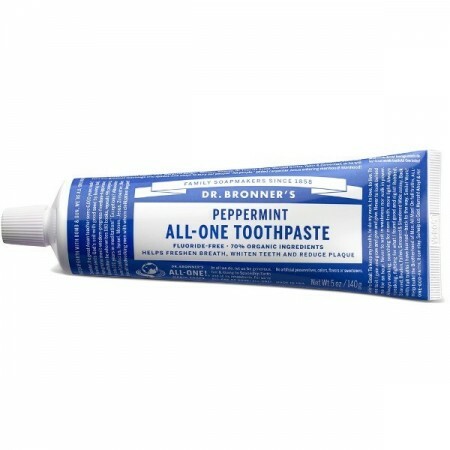 All-round great toothpaste, vegan and cruelty-free!